Calling all gypsies, jousters, kings, queens, knights, and all fans of turkey legs. The Arizona Renaissance Festival is back every Saturday and Sunday and President’s Day starting Feb. 9th to March 31st from 10am to 6pm, rain or shine! Plan on being at the festival for a non-stop, day-long family fun adventure! This medieval amusement park features 13 theater stages (not for the shy ones, you may be called upon), a 30-acre circus, arts and crafts fair, the jousting tournament arena and endless food/drinks. Be transported back to the 16th century European village as you walk through the gates. 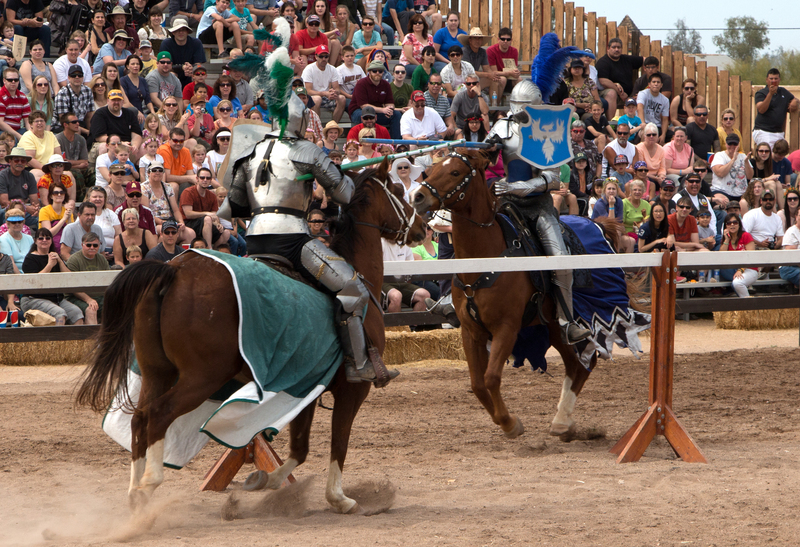 Mingle with the 2,000 costumed characters, watch the knights joust, eat a giant turkey leg or take part in the games of chance and skill. The 13 stages are filled with comedy, swordplay, music and hijinks. If none of that has caught your attention, then visit the 200 artisan shops – a shopper’s paradise. Watch the skills of glassblowing, leatherwork, weaving, woodcarving, blacksmithing, candle making and pottery. There is something for everyone at the Arizona Renaissance Festival. Take the kiddos to see the wonders of the sea and watch the mermaid show or be a fairy for the day. Adults can be treated like royalty at the Pleasure Feast. Reserve seats for the Pleasure Feast online or email tickets@RenFestInfo.com. Admission for the Pleasure Feast is $75.95 and includes admission to the park, 5 course meal, 1.5 hours of royal entertainment, selection of beverages and a souvenir. General admission for the Arizona Renaissance Festival is $26 for adults, $16 for children (5-12), and children under 5 are free. Purchase discount tickets at Fry’s Food Stores. Tickets are available online, or at box office in front of the festival. Pets are not allowed. Parking is Free. The festival is located at 12601 E. US Highway 60, Gold Canyon 85118.